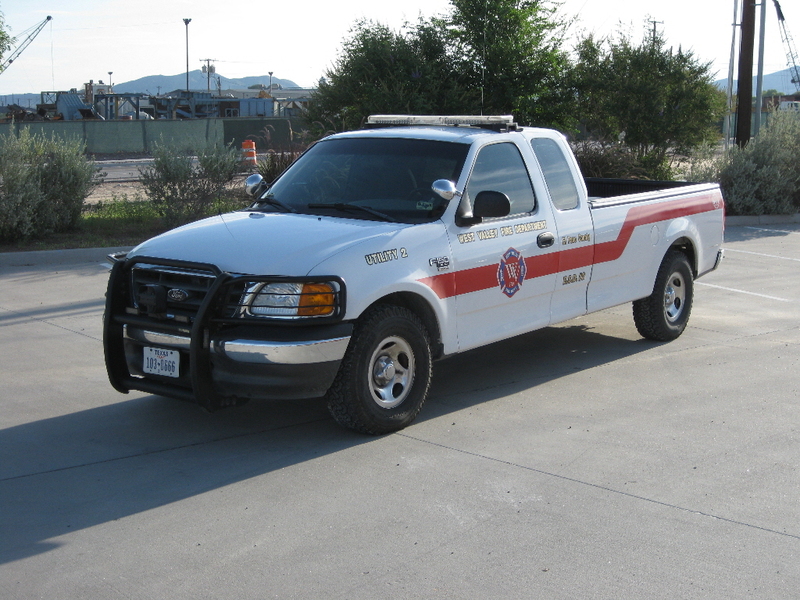 2010 Chevy Silverado 4x4, Equipment: Full complement of medical and firefighting gear. In addition scene lighting, and Incident Command for simple to major incidents. 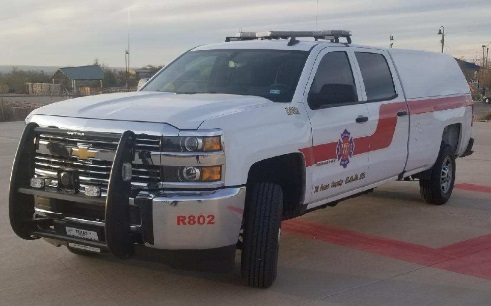 2010 Chevy Silverado, equipped with a full complement of firefighting and BLS medical equipment, along with traffic control, digital imagery, scene lighting and Incident Command capabilities. 2015 Chevy Silverado 4x4. 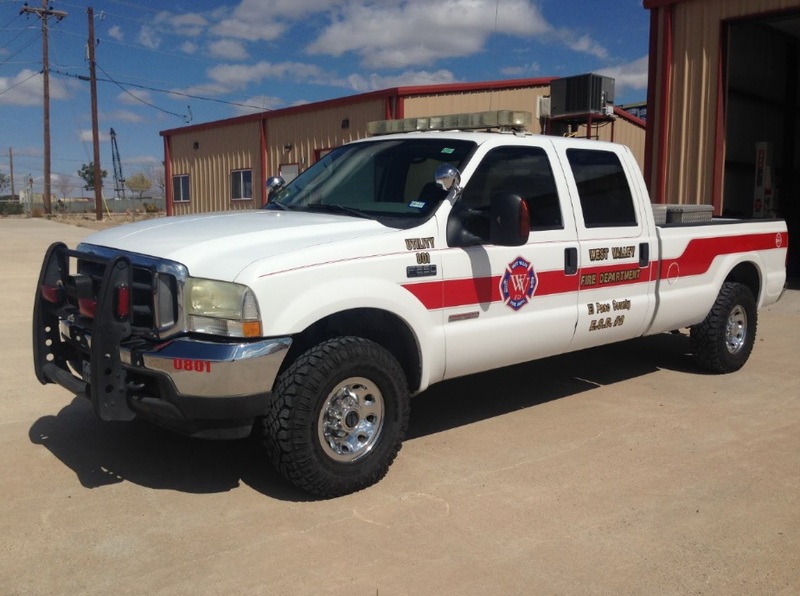 This vehicle features a command slide out, light fire fighting equipment, a winch, and full medical equipment. 2009 Pierce Contender. 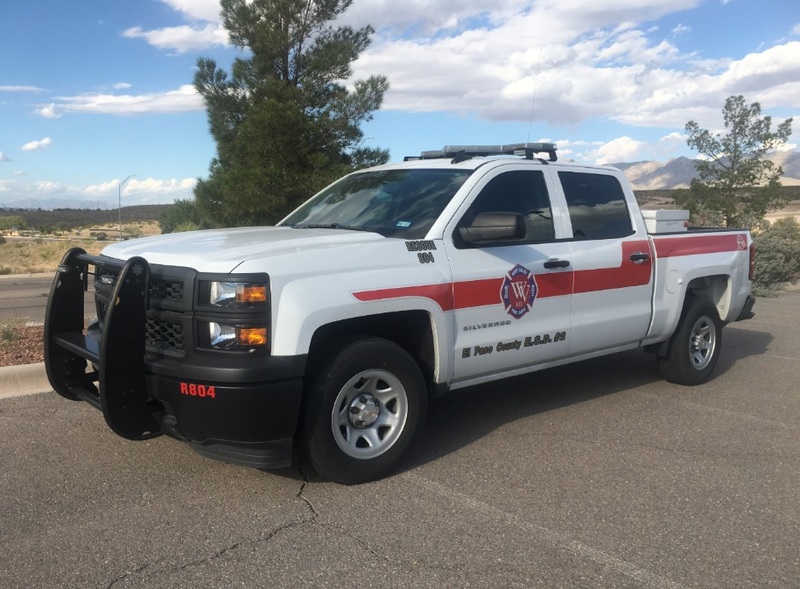 Features: 1000-gallon booster tank; 30 gallon Class "A" Foam tank; 30 gallon AFFF tank, 1200' of 5" supply hose; 700' of 1.75" attack hose; 600' 0f 2.5" hose; 9, Scott 4.5 SCBA's; Thermal Imager Camera; RIT kit; PPV; Circular saw; Vent saw; AED; Medical jump bags; 12 volt, 120 watt scene lighting. Housed at the Vinton Station. 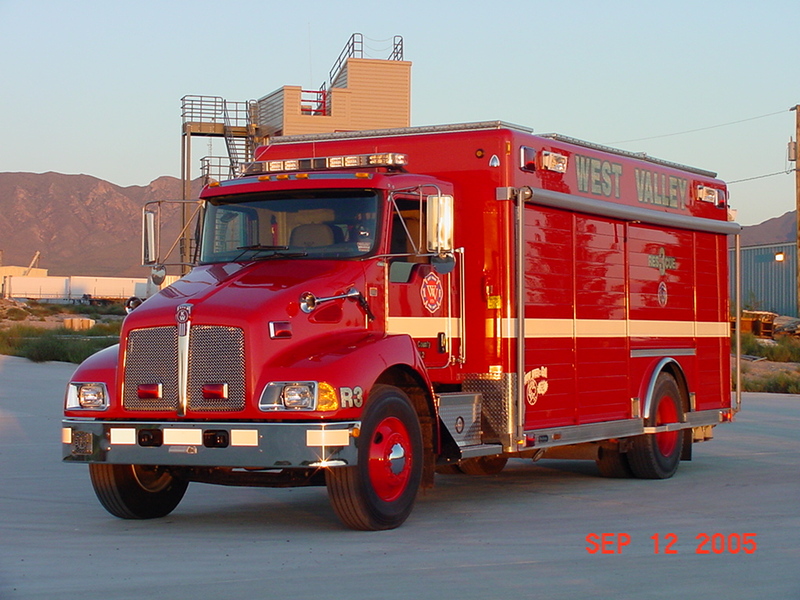 2000 Pierce Contender, on an International chassis, 1000 Gallon tank, 1250 gpm pump. Housed at the Anthony Station. 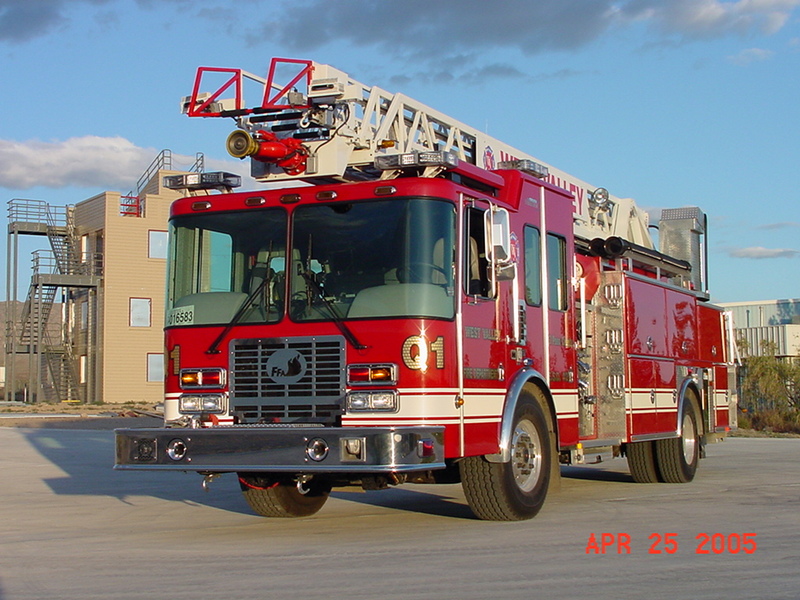 2001 Pierce Contender, Custom chassis, 1000 gallon tank, 1250 gpm pump. Housed at the Canutillo Station. 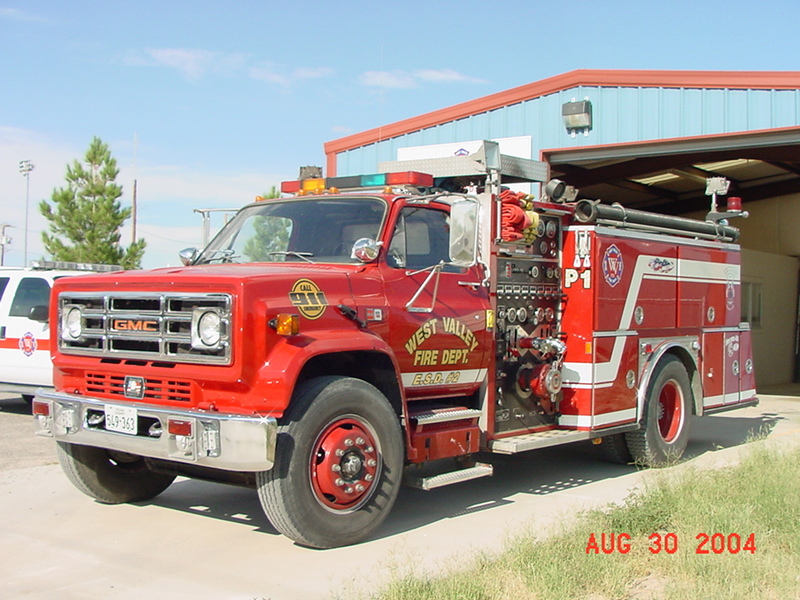 This unit is a 1988 E-one Pumper. 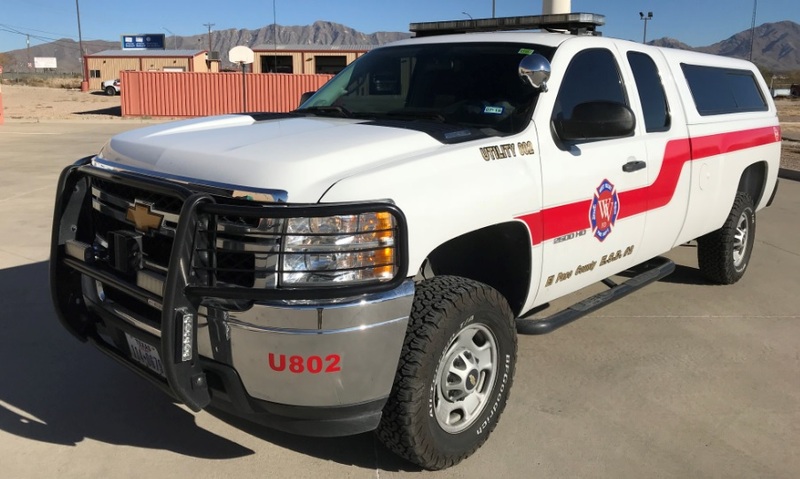 Originally it belonged to the Clint Fire Department, and also the Socorro Fire Department before we took possession in 2015. It has a 1000 gallon water tank, and a 1250 gpm pump. It was refurbished in 1999 to include fully enclosing the cab. 2004 Ferrara Inferno 2. TRUCK STATS: Aerial Ladder: 77ft Pump: Waterus 1500 gpm Tank: 400 Gal Hose: 1600ft of 5" supply line 500ft 2.5" supply line (2) 200ft 1 3/4" crosslays pre- connected (1) 100ft 1 3/4" front trash line pre-connectd (1) 200ft 2 1/2" crosslay pre- connected Ground Ladders: (1) 35' (1) 24' (2) 16' (1) 14' Equipment: Hand Tools, Generator, onboard and umbilical lighting, circular saw, chain saw, thermal imager just to list a few. Housed at the Vinton Station. 2006 Ford F550 4x4. Features: 300 gallons water; 2, 10-gallon foam cells (Class A foam and microblaze). 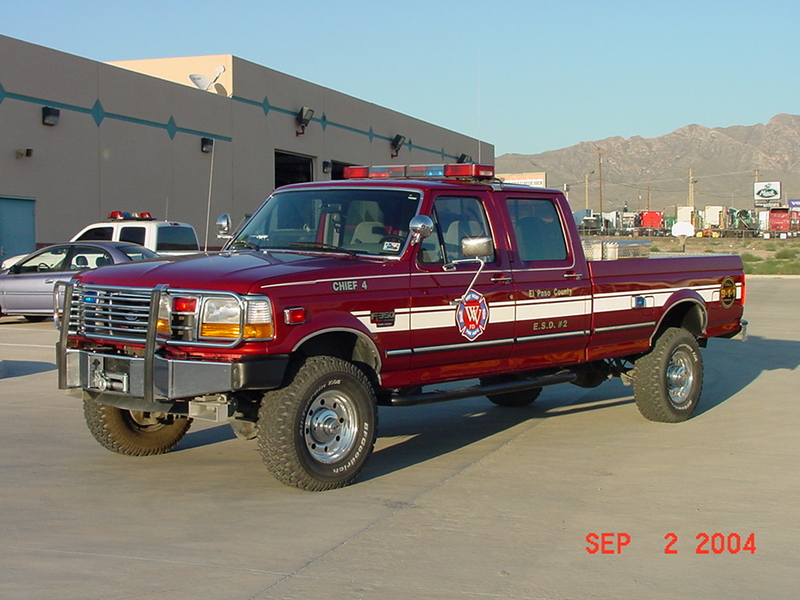 This unit was desinged for use as a wildland fire rig and as a mini rescue. It not only carries a variety of tools for brush fires, but it also carries the jaws of life set for vehicle accidents/rescues. Housed at the Canutillo Station. 2016 Pierce / Ford F550. 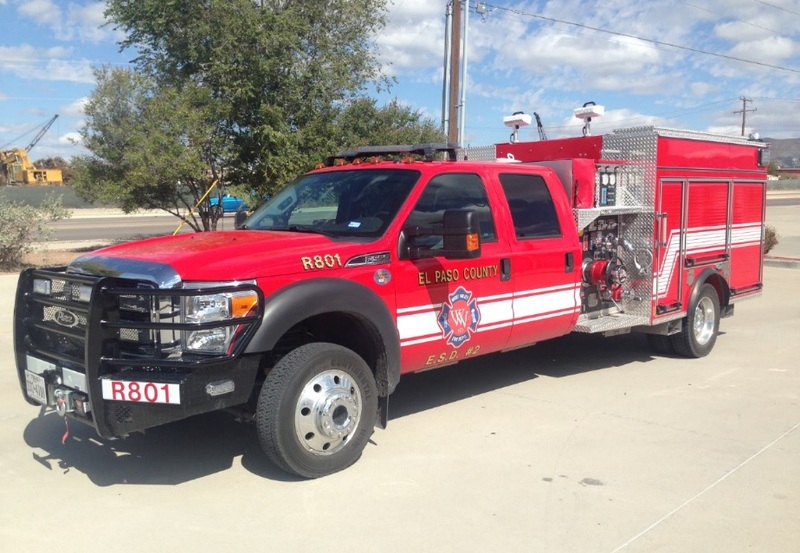 This unit has a 1000 GPM PTO pump, 300 gallon water tank, foam pump, 800 feet of 4 inch supply line, 600 feet of 2.5 inch, two - 1.75 inch 200 foot cross lays, full 360 degree LED lighting, a winch and it's four wheel drive. 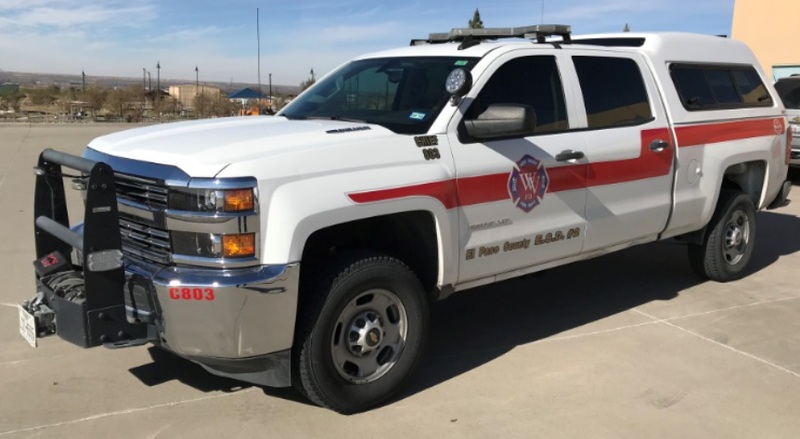 2017 Chevy 2500 pickup - First Responder vehicle. 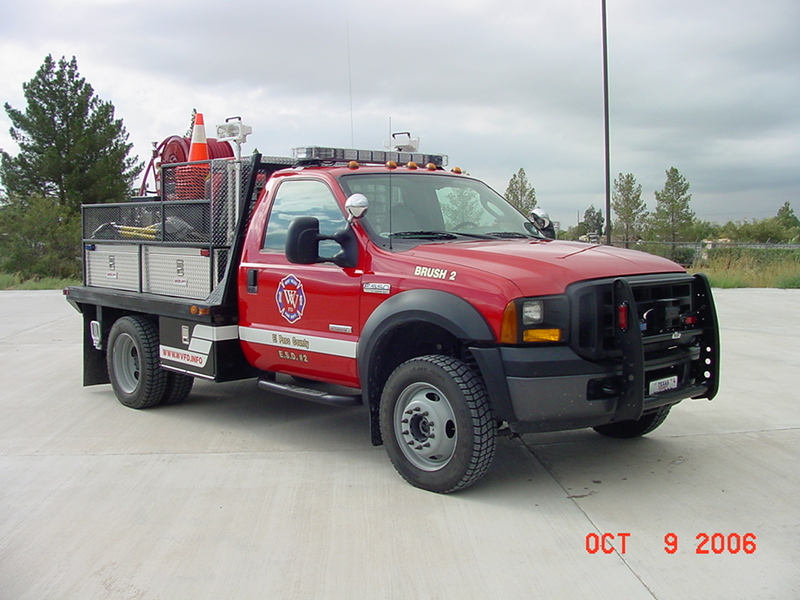 2005 Hackney Heavy Rescue. R3 responds to special rescue situations to include rope rescue, heavy extrication, confined space, and water rescue events. This unit is also loaded with an SCBA cascade system, shade tarps, and other equipment that makes it ideal for rehab use during extended situations. Stored at the Vinton Station. This is a 2015 Chevy Silverado. 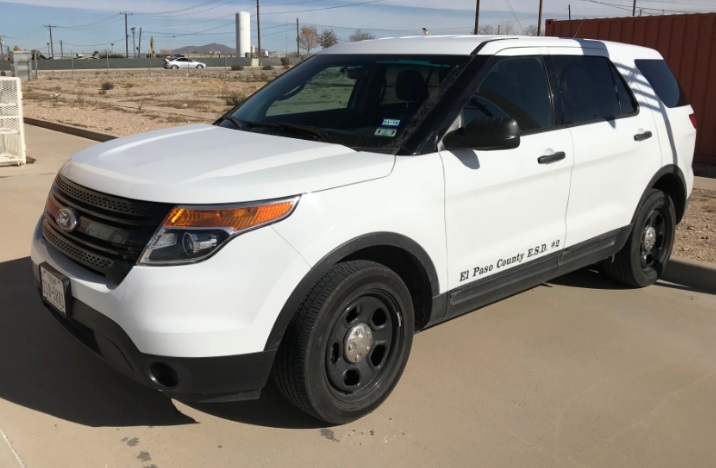 It is a take home unit for Captain Martin Lerma. It carrier a full compliment of medical gear. 2004 Ford F-250. 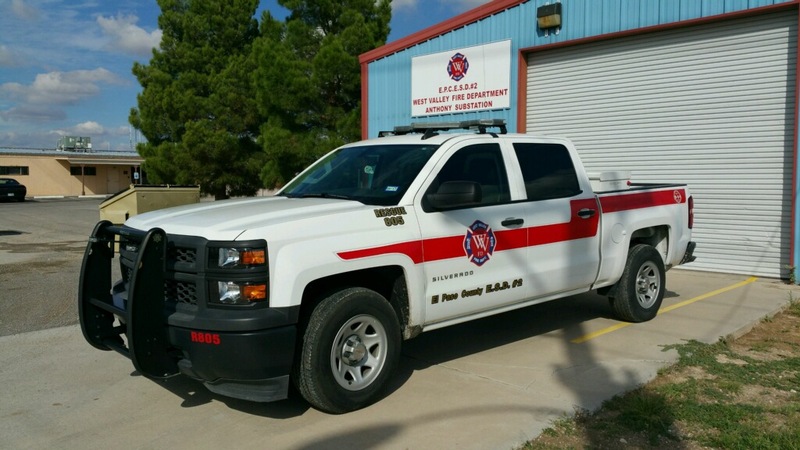 This vehicle carries a 115 gallon diesel fuel tank for on scene re-fuel operations of the fleet. Prior to it's new assignment this vehicle was Chief 803's response unit. 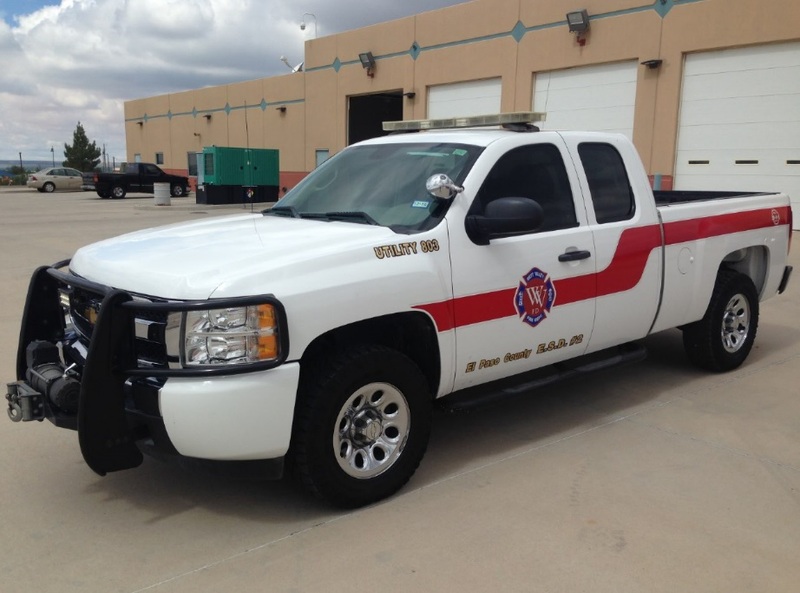 2013 Chevy Silverado quick response vehicle. This vehicle has full medical gear and is assinged to Capt. Manny Maldonado. This 2010 Chevy Silverado is kept at the station, and it checked out by the membership who wish to respond from home. This allows quick response to medical calls since it has a full compliment of medical gear. 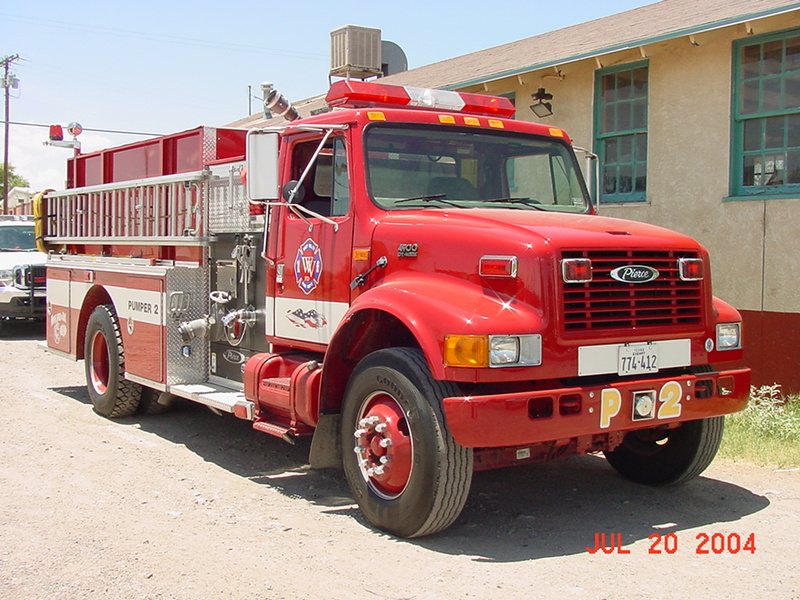 This was the first Department issued "Chief Truck" during it's front line service it was knows at Chief 1, Chief 2, Chief 4, and finally Rescue 804. It was a 2001 Ford Expedition. Carries a complement of traffic control, firefighting and BLS medical equipment. 2004 Ford F150. 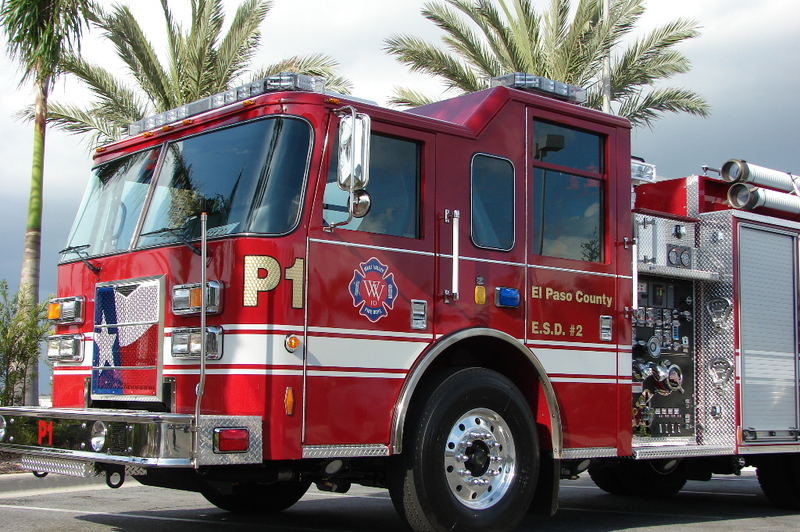 Carries a variety of traffic control, firefighting, and BLS medical equipment. 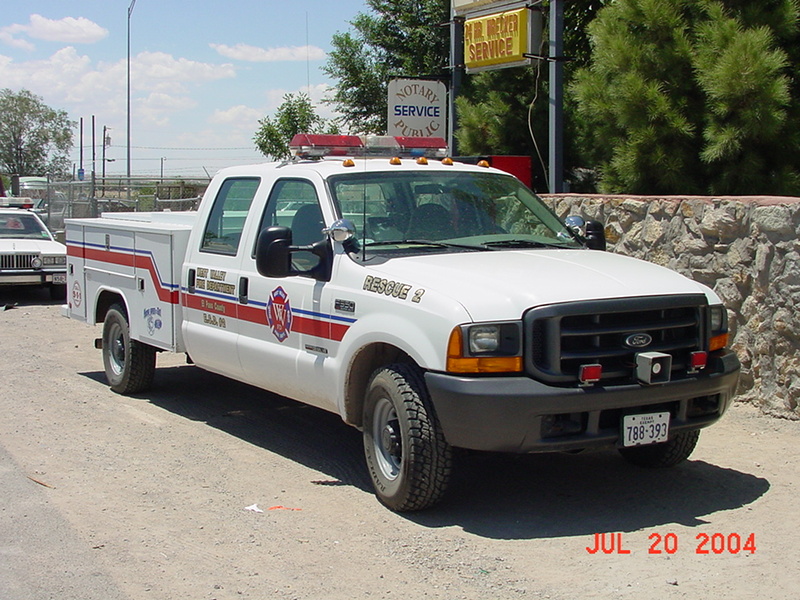 1997 Ford F350 4x4, Equipment: onboard computer, GPS, Incident Command, medical jump bags, AED, hand tools, forcible entry tools, 10,000 lbs front mount winch, temperature sensing, traffic control, 115 gallon external diesel supply tank for fueling apparatus on extended emergencies. 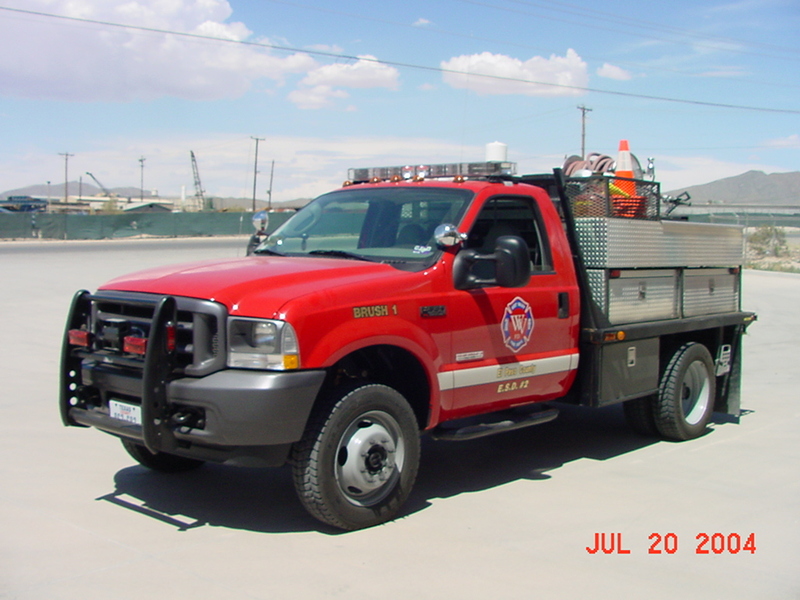 This engine was the first "New" unit the then "Canutillo Volunteer Fire Department" ever had. Before then every unit was used, and usually donated from another department or place. This unit was a 1989 GMC/American Eagle-structure engine. 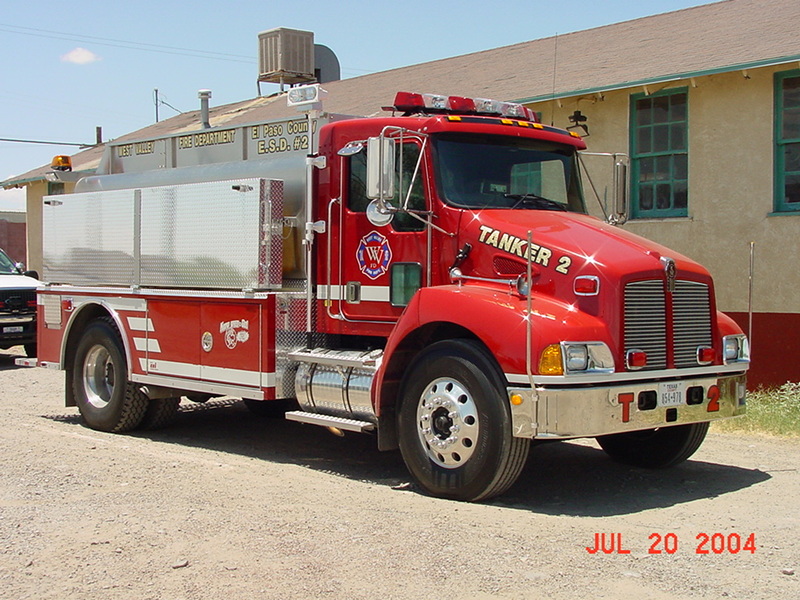 It carried 750 gallons of water, had a 1000 gpm pump, a compressed air for foam system, 4kv generator, (4) 500 watt quartz scene lights, 1200 ft of 4 in. LDH (Large Diameter Hose),600 ft of 2.5 in., 2 pre-connected cross lays of 1 3/4 hose 200 ft each, (1) 1 3/4 in. rear pre-connect 200 ft, and (1) 1 in. red line rear mount reel 200 ft.